I'm always on the lookout for great beauty products that promise to get rid of or lighten blackheads. Why? Aside from dreaming to have nearly flawless skin, when I put on my makeup, my main concern is to conceal my pores - especially the ones clogged with unsightly blackheads! If I had less visible pores, or even just 'cleaner' pores, then this wouldn't be such a worry for me anymore, of course. 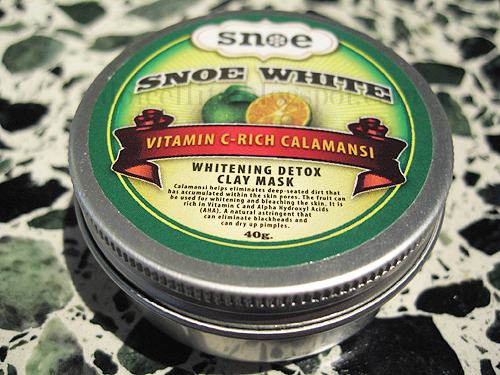 This is why I'm so glad I discovered Snoe's Snoe White (whitening detox clay mask with vitamin c-rich calamansi)! The packaging is simple but quite cute and comes in a small, resealable tin with 40grams of the product. The label on the front even gives you some info on the power of calamansi and why it's in the product. Calamansi helps eliminate deep-seated dirt that has accumulated within the skin pores. The fruit can be used for whitening and bleaching the skin. It is rich in Vitamin C and Alpha Hydroxyl Acids (AHA). A natural astringent that can eliminate blackheads and can dry up pimples. Sounds great already, doesn't it? And even though I'm already fair-skinned, I wasn't worried about its additional claim to whiten or bleach the skin because even though I've tried face products in the past that claimed the same thing, I haven't noticed a change in my skin tone (save for bb creams that tend to create a white mask on my face if I apply too much of it, but that's a different story!). 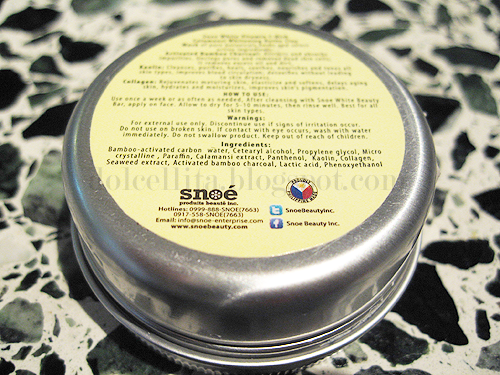 Some additional info on the product, and yes, it's a locally made product too so hooray for Snoe! Snoe White Vitamin C-Rich Calamansi Whitening Detox Clay Mask of pure botanicals, herbs, and select ingredients, absorb impurities and control excess oil to detoxify and renew your skin from deep within. Revitalize skin and help protect against the appearance of aging. Radiate health and beauty with Snoe Beauty Products! Active Ingredients added to Calamansi:Activated Bamboo Charcoal -- attracts and absorbs impurities. It unclogs pores and removes dead skin cells from the top layer of the skin as it removes excess oil and dirt from pores effectively and completely. Kaolin -- cleanses, purifies, heals, soothes, nourishes and tones all skin types and improves blood circulation without leading to skin dryness. Collagen -- rejuvenates maturing skin, elasticize and softens, delays aging skin and hydrates and moisturizes as it improves skin's pigmentation. How to use:Use once a week or as often as needed. After cleaning with Snoe White Beauty Bar, apply on face. Allow to dry for 5-10 minutes, then rinse well. Best for all skin types. Ingredients:Bamboo-activated carbon water, Cetearyl alcohol, Propylene glycol, Micro crystalline, Paraffin, Calamansi extract, Panthenol, Kaolin, Collagen, Seaweed extract, Activated bamboo charcoal, Lactic acid, Phenoxyethanol. 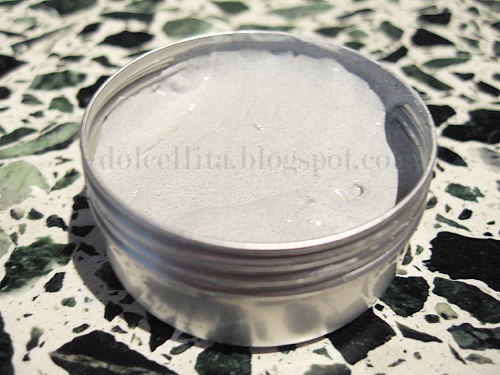 The product itself is a little darker in real life, the lighting is just too bright, but it's a smooth, grey paste with a mild, pleasant scent. It has darker colored 'granules' in it (but they're too small to actually be felt), which I assume is the charcoal? Additional good news is that a little bit goes a long way with this product! I only need to scoop up once with my index finger and that's all I need to cover to all of my nose, which is where I use it primarily, and even on some more of my more visible pores on my forehead. So how did it fare with me? I can't emphasize how much I love this product since it's gotten rid of and lightened a lot of my gross blackheads and made my nose appear cleaner and smoother! I no longer need to layer on BB cream or foundation on my nose anymore either, and I use significantly less concealer on it (my nose) too! I've heard others have experienced that their skin has become less oily/shiny with continued use as well. Just fyi, since I tend to have very deep-seated and stubborn blackheads, I've been using this every other day throughout the week. I plan to shift to using it every few days once this hopefully gets rid of even more of them as 'maintenance' to help keep my pores/skin as clear as possible! You're welcome! Thank you also and glad you like the review, doll. Hope this works as well for you as it did for me! I didn't know this mask contained AHA. If it really does, then I'd be impressed.